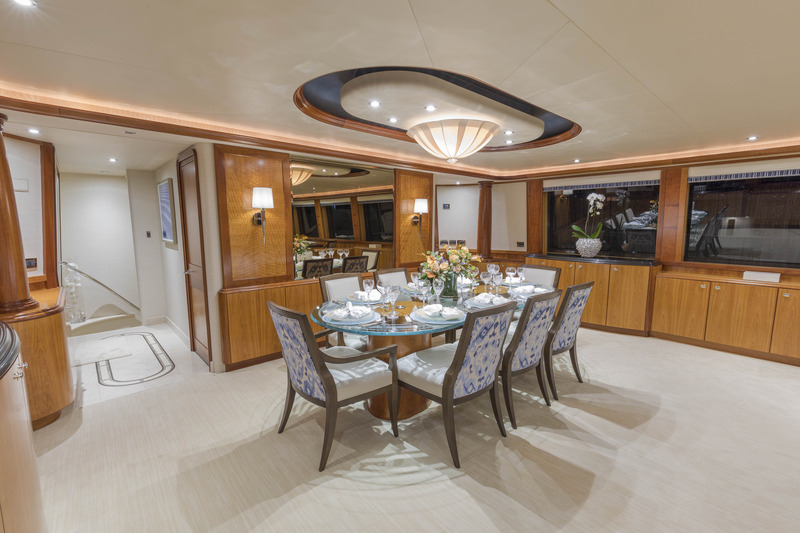 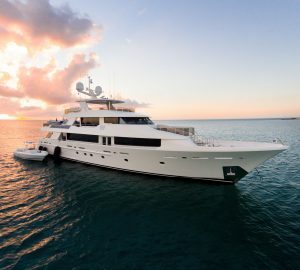 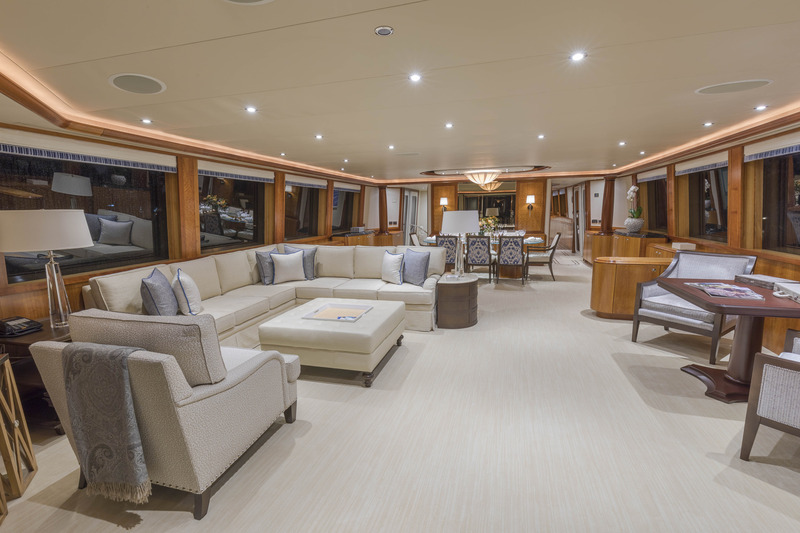 Built by Westport in 2005 and last updated in 2017, 34m/112ft superyacht CANIRA (ex.LADY RAYE) features a semi-displacement hull and exterior styling from Gregory Marshall while her interiors are the work of Pacific Custom Interiors. 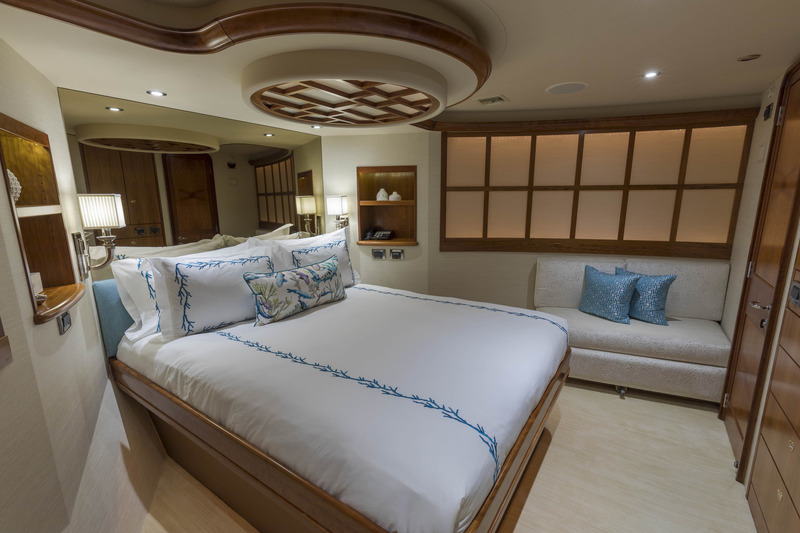 The accommodation sleeps eight guests over four cabins. 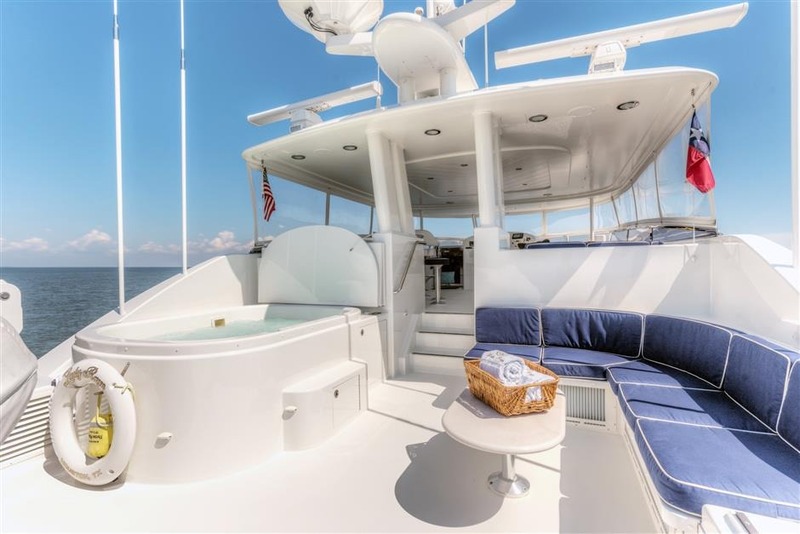 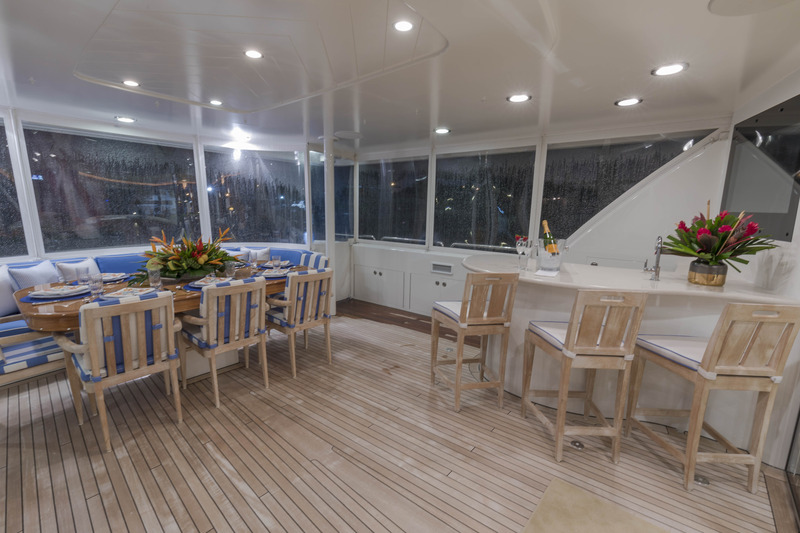 The main deck aft is an enclosed environment for use in all weather. 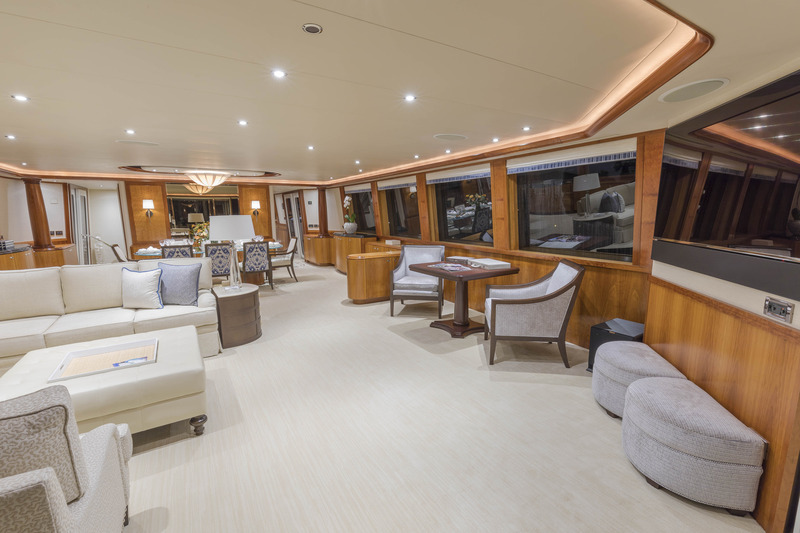 The area can be air conditioned and offers guests a bar, a casual dining area that can also be used for work and hobbies. 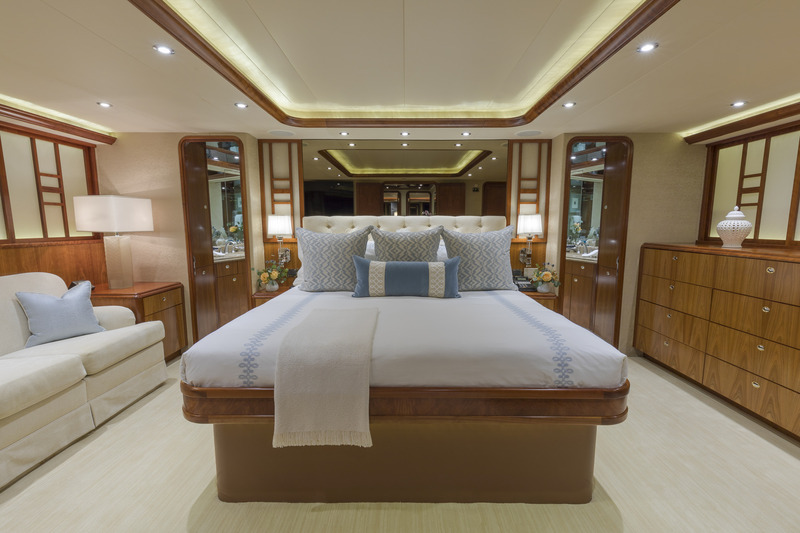 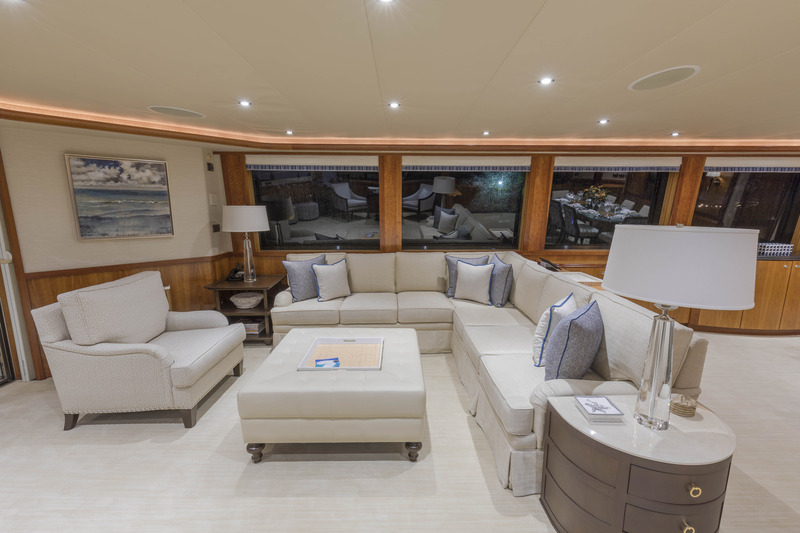 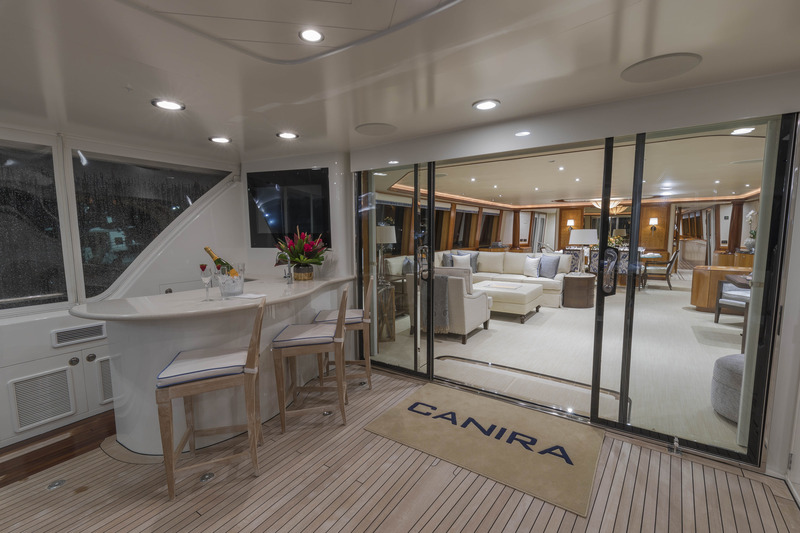 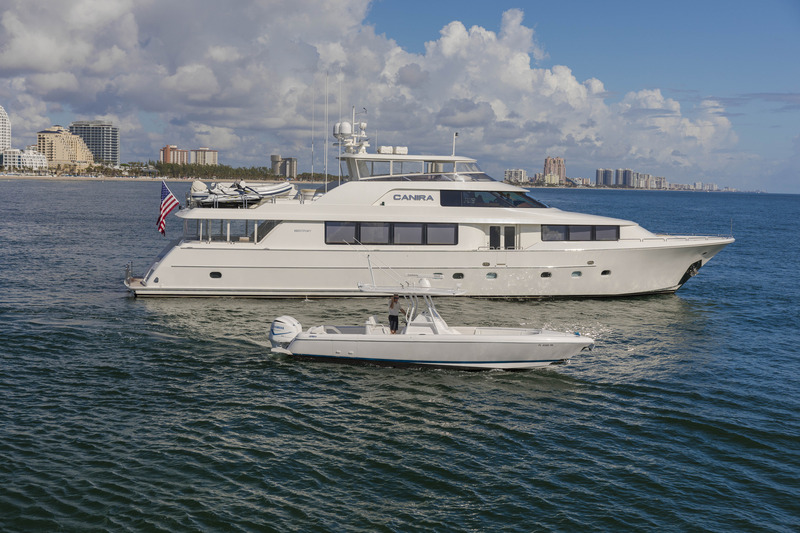 A staircase connects to the flybridge, where the tenders are stored to the aft and the central section places an L-shaped seat and oval spa pool in the sunshine. 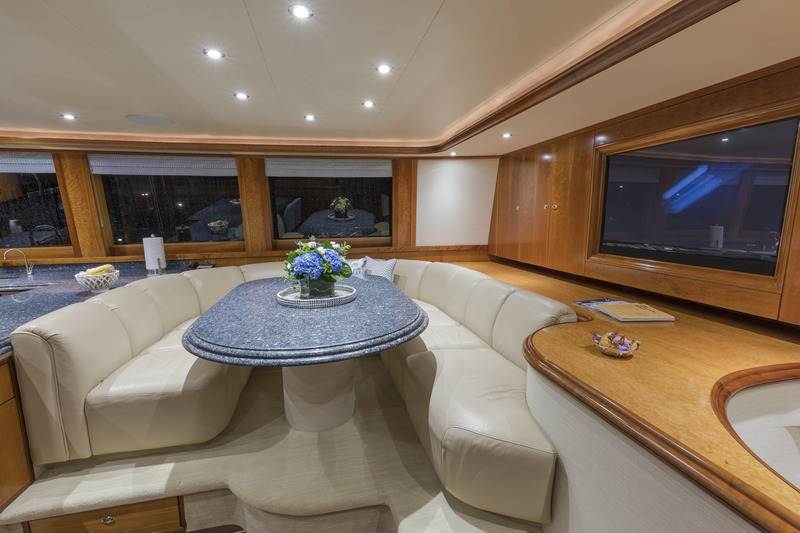 The shaded cockpit offers another resting spot out of the sun where guests can take in the scenery. 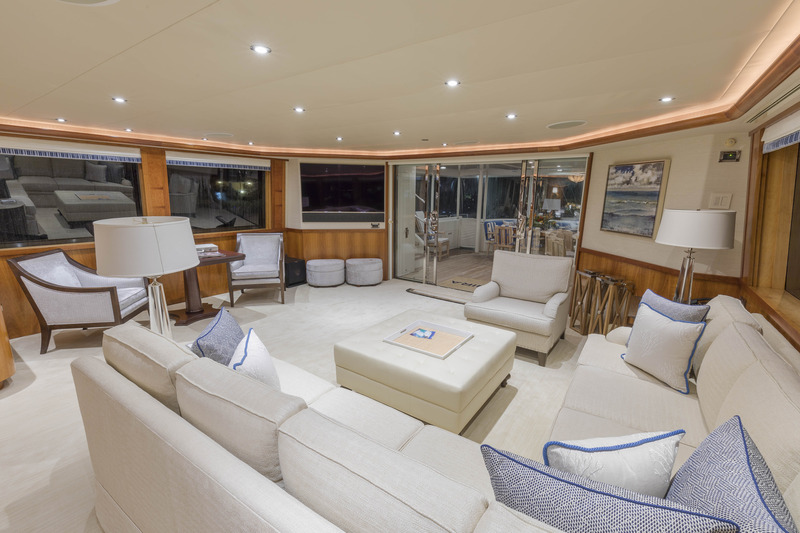 The main deck contains an open plan interior that combines classic styling with contemporary colours for a refreshing indoor environment. 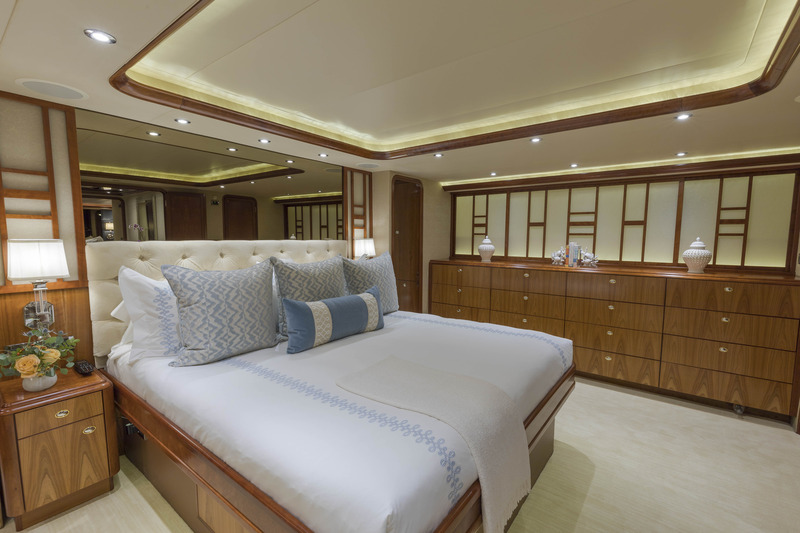 Furnishings in crisp white and pale blue contrast against the mid-toned wooden panelling that frames the windows running the length of the space. 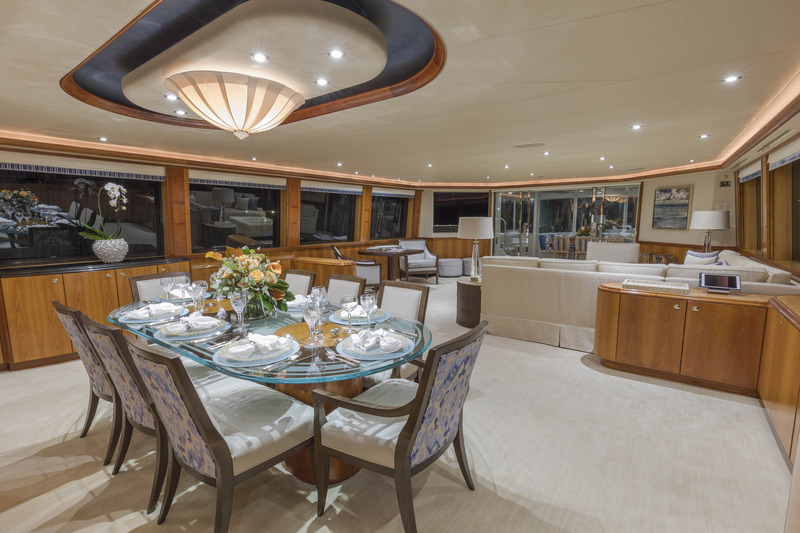 Forward, there is a formal dining area to seat up to eight guests and to the aft there is a large contemporary living area with a corner sofa, arm chairs and a coffee table. 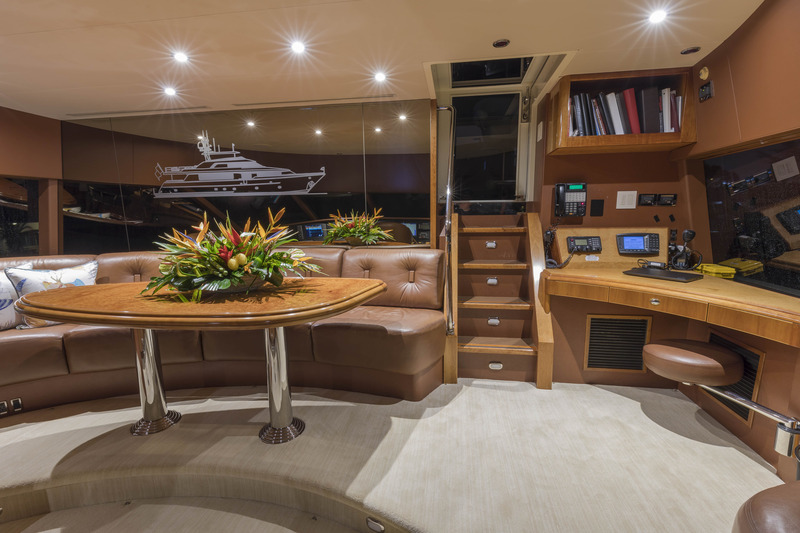 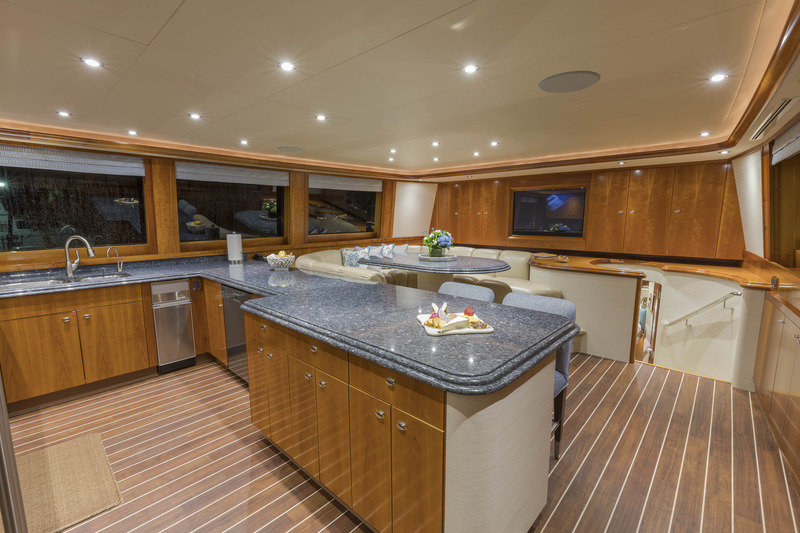 Above, the galley has a breakfast bar, a curving sofa with a raised table for casual dining and a TV in the wall. 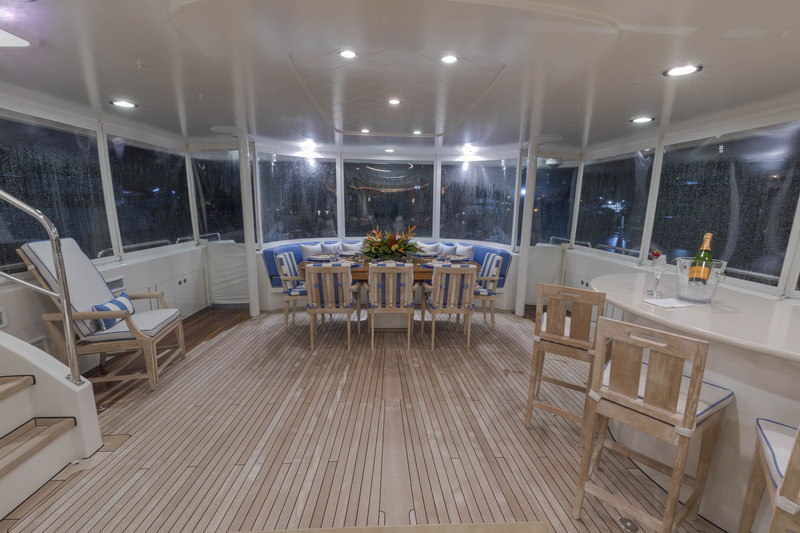 The pilot house has a guest area fitted with a curving sofa and a table where guests can watch the action through the glass screen or use the area as a private retreat. 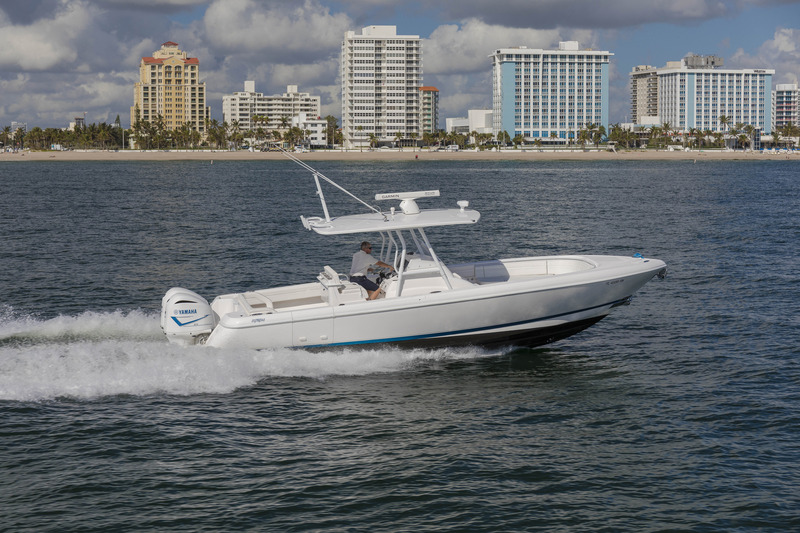 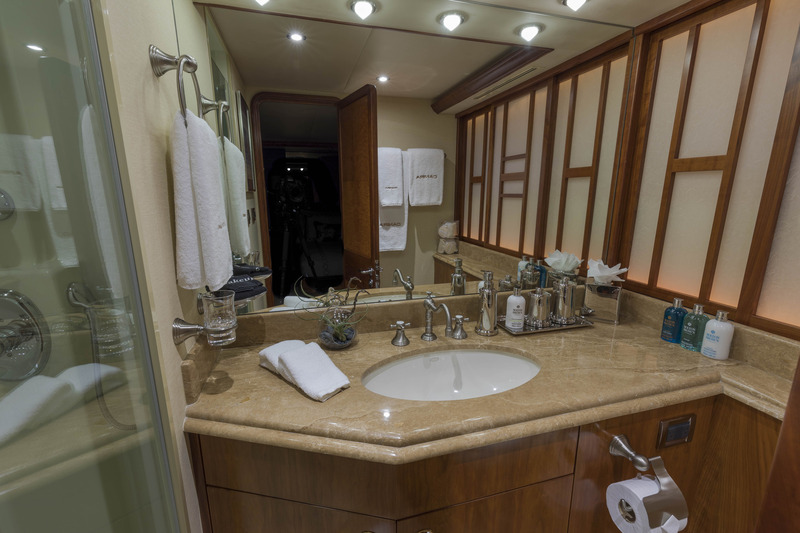 2 x MTU 16V2000 2000B HP engines produce a cruising speed of 22 knots. 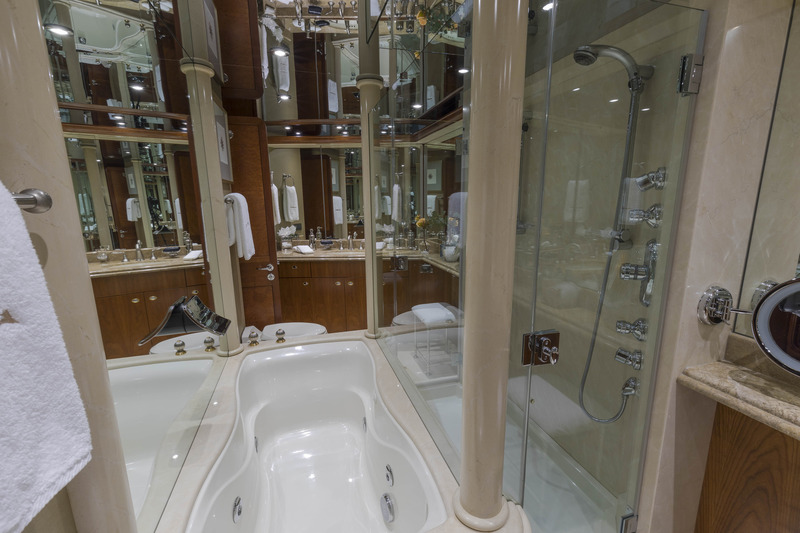 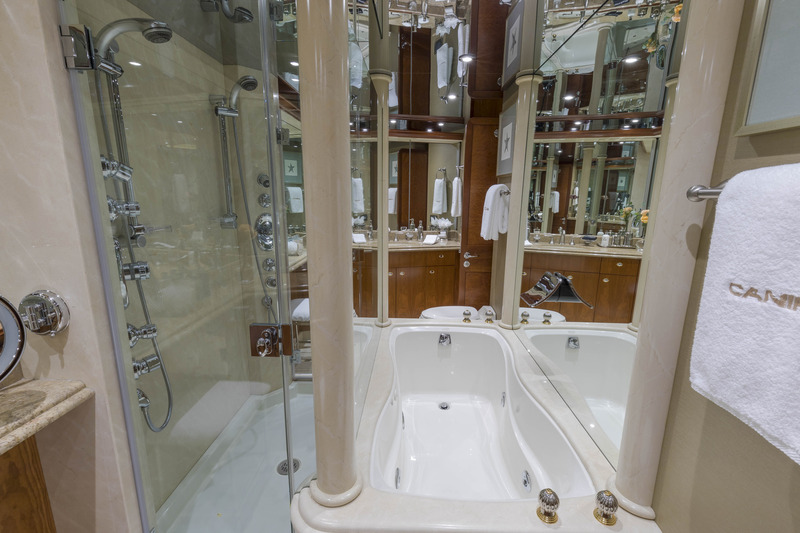 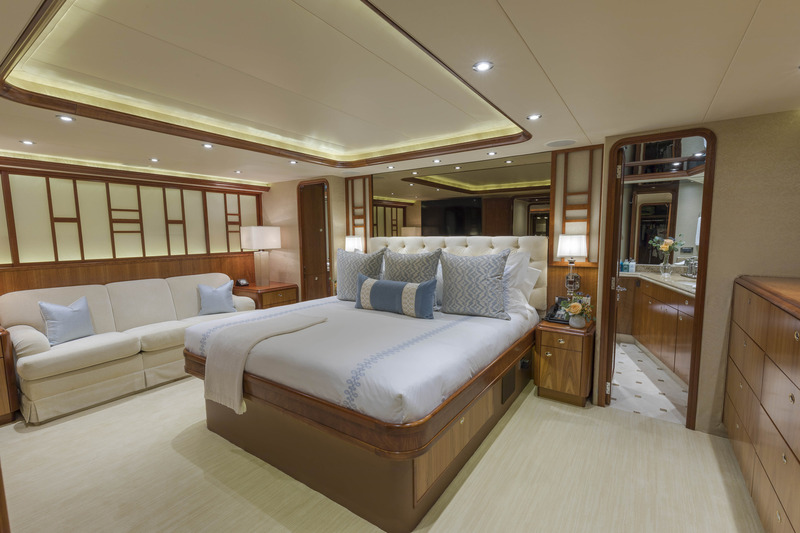 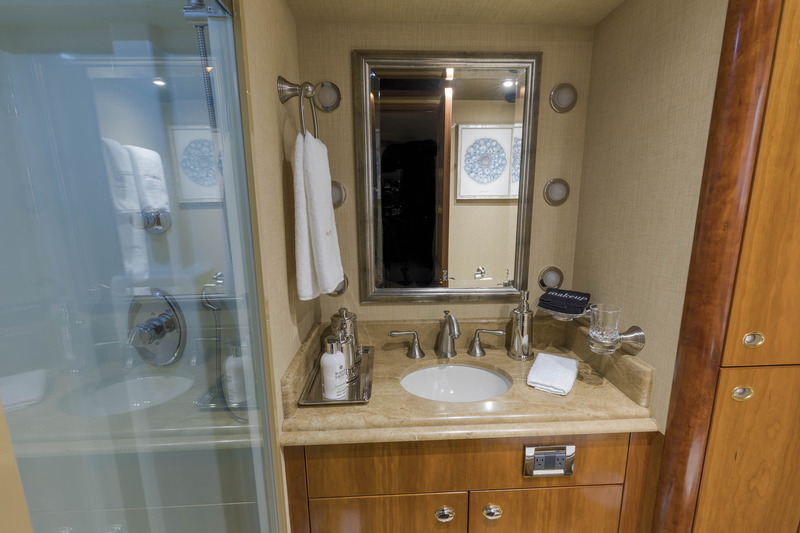 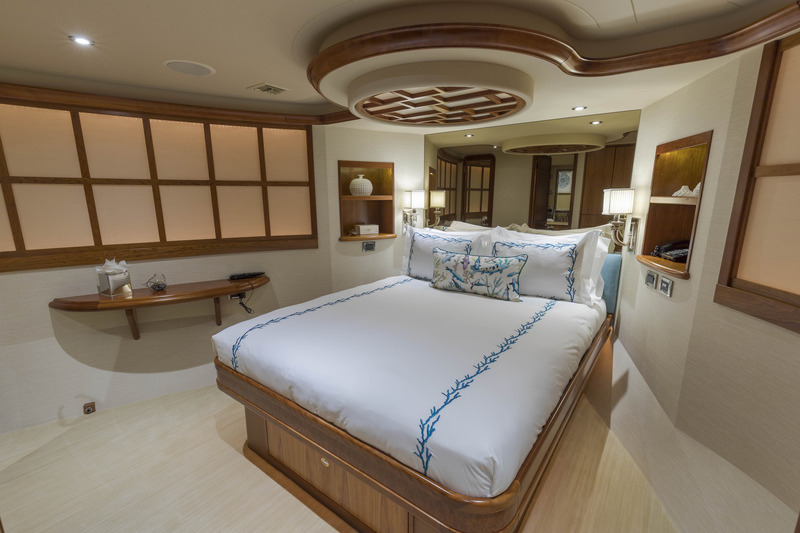 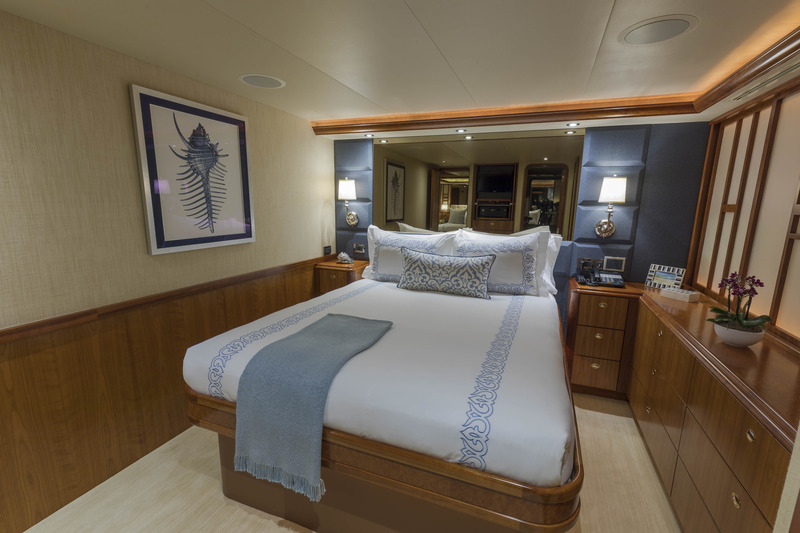 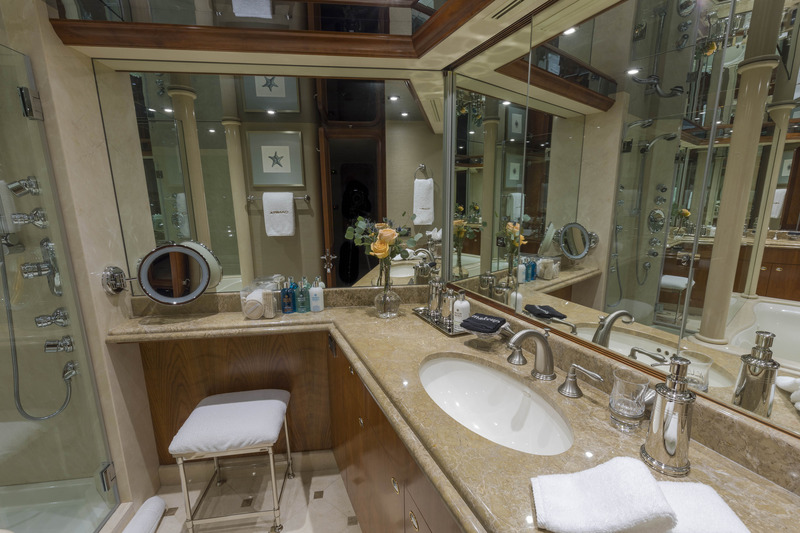 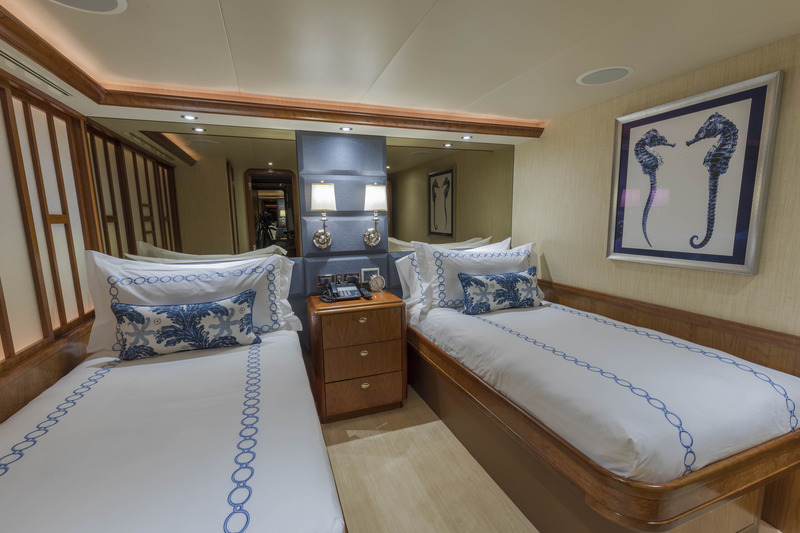 The accommodation sleeps up to 8 guests across 4 cabins: 1 Master suite, 2 VIP staterooms and 1 twin cabin, all of which have en-suite facilities and are located on the lower deck. 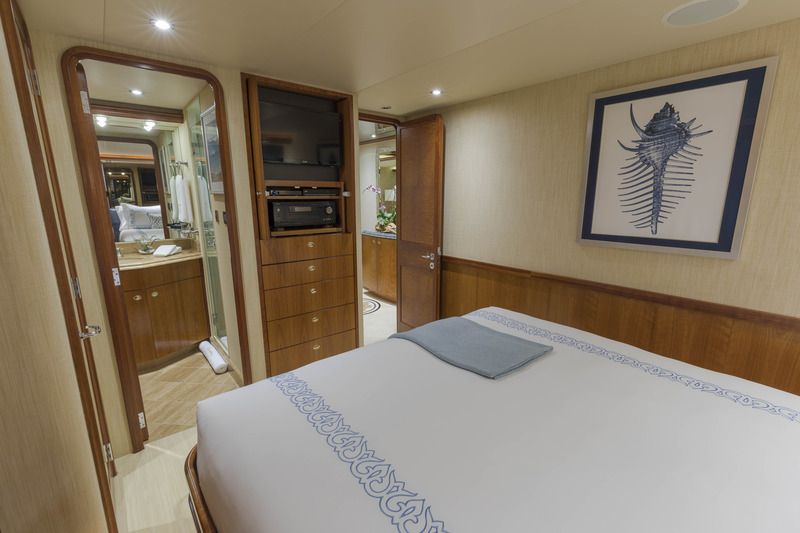 The dedicated crew of 4 provide everything guests require for a comfortable and relaxing cruising experience.